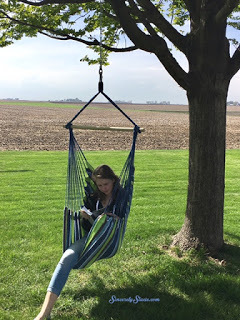 Summers under the big shade tree in our backyard will be so much more enjoyable with our new Brazilian Hammock Chair. I can’t tell you how excited our whole family is about this chair. I have a feeling we will all be fighting over it this summer. This is an oversized hammock chair in green and blue stripes. It is quite durable and extremely comfortable. 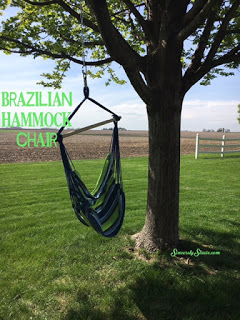 You can sit upright or spread out the fabric and lay flat in it while swinging in the breeze. We chose to hang ours from a tree in our backyard, but it could be hung on porches or decks as well. It’s light so you could move it around and take it with you if you go camping, you just have to have the mechanisms to hang it. It does not come with the materials used to hang it, but they were easily found at our local home store. My husband had it hung up in less than half an hour. 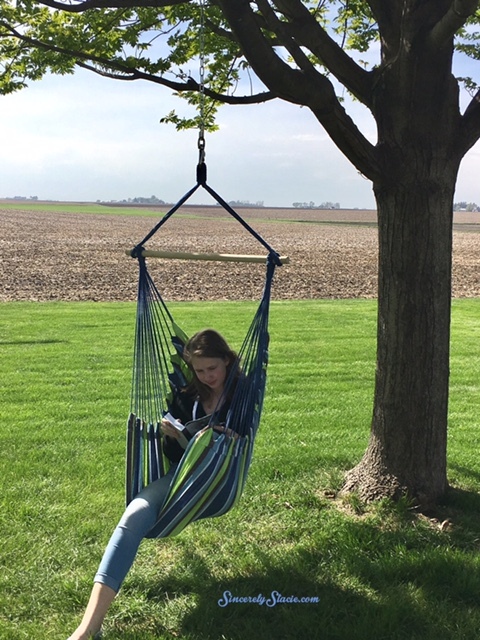 This hammock will make the perfect reading spot for the summer. I can’t wait to enjoy it…if I can ever get my daughter out of it! If you’d like to get your own Brazilian Hammock Chair, use promo code HAMMIHL1 for 15% off at checkout by clicking HERE. If you have Amazon Prime, you can get free two-day shipping and have this item for just over $20. Thanks so much to Breakthrough Premium Products for sending the product for the purpose of this review. This review is my honest opinion. If you choose to purchase this product through the above links, I may receive a small commission without you having to pay a cent more for your purchase. Thanks for supporting SincerelyStacie.com. Thanks for the great review. I was looking for one of these for my husband.